An astronomical amount of goods are shipped and transported in various types of drum. Steel drums, poly drums, stainless drums and many other types of drum are ideal for robust protection of easily damaged items like tomatoes or provide high security for chemicals and fuels. One thing they all have in common is they are heavy! Too heavy to lift! And there it was; the light bulb moment- the drum lifter was born! But it wasn’t just that simple, there was more than just lifting a drum, there was a requirement for transportation, lifting, stacking and turning. 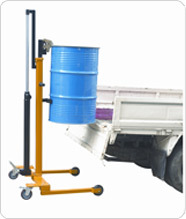 There is pretty much a drum lifter for every application available from Lifting Equipment Store. Our abilities also extend to supplying top quality UK made ATEX Spark Resistant, Stainless Steel and various other specialist drum lifters and handling equipment to the Nuclear and Gas industries. Challenge us today! This entry was posted in Business & Lifting Equipment and tagged diesel, dolley, dolly, drum handling, drum handling equipment, drum lifting, gas, heavy, lifter, lifting equipment, off shore, oil, petrol, plant, plastic, poly, processing, rigging, sack truck, trolley, truck. Bookmark the permalink.